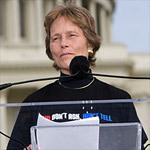 This call to action comes from Joan Darrah, who is a survivor of “Don’t Ask, Don’t Tell,” (DADT) and a member of the Mount Vernon Unitarian Church in Alexandria, VA.
President Obama, Defense Secretary Gates, General Colin Powell, and an overwhelming majority of the American people also support repealing DADT and finally allowing gays to serve openly with honor. It is time for the U.S. Senate to act and our UU voices will make a difference. Please take a minute or two and e-mail or call your Senators and urge them to support legislation to end “Don’t Ask, Don’t Tell” and vote for repeal this year. The best way to erase the law from the books in 2010 is for the Obama Administration to include repeal in the defense authorization bill and then for Sen. Carl Levin (D-Mich.), chairman of the Senate Armed Services Committee, to include repeal of the law in the defense bill he reports out of his committee. Everything about DADT is contrary to everything that Unitarian Universalists stand for. Please make your voice be heard. Thank you for taking action.